The prestigious Leadership or Skills Development Solution Provider of the Year award is part of the 2016 Stevie® Awards for Great Employers. 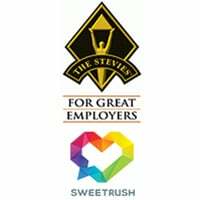 San Francisco, CA., August 20, 2016 – SweetRush Inc., was named a Finalist in the Leadership or Skills Development Solution Provider of the Year category in the 2016 Stevie® Awards for Great Employers. SweetRush will ultimately win a gold, silver, or bronze award on September 30, 2016, at a gala ceremony. Details about the Stevie Awards for Great Employers and the list of Finalists in all categories are available here. The Stevie Awards are conferred in seven programs: The American Business Awards, the German Stevie Awards, The International Business Awards, the Stevie Awards for Great Employers, the Stevie Awards for Women in Business, the Stevie Awards for Sales & Customer Service, and the Asia-Pacific Stevie Awards. Honoring organizations of all types and sizes and the people behind them, the Stevies recognize outstanding performances in the workplace worldwide. Learn more about the Stevie Awards here, and follow the Stevie Awards on Twitter.